The Fremont County Board of Commissioners whisked through a three page agenda in less than an hour quickly disposing of routine business items as part of the annual reorganizational meeting. The Board chose to leave the leadership positions the same for another year. District 2 Commissioner Debbie Bell made that recommendation suggesting that District 3 Commissioner Ed Norden serve another year as chairman during his final year in office. Commissioner Bell will then serve another year as Vice Chairman. District 1 Commissioner Tim Payne will continue in his role as Chairman of the Fremont County Board of Social Services. The Board also reappointed Brenda Jackson to serve another year as the County Attorney. 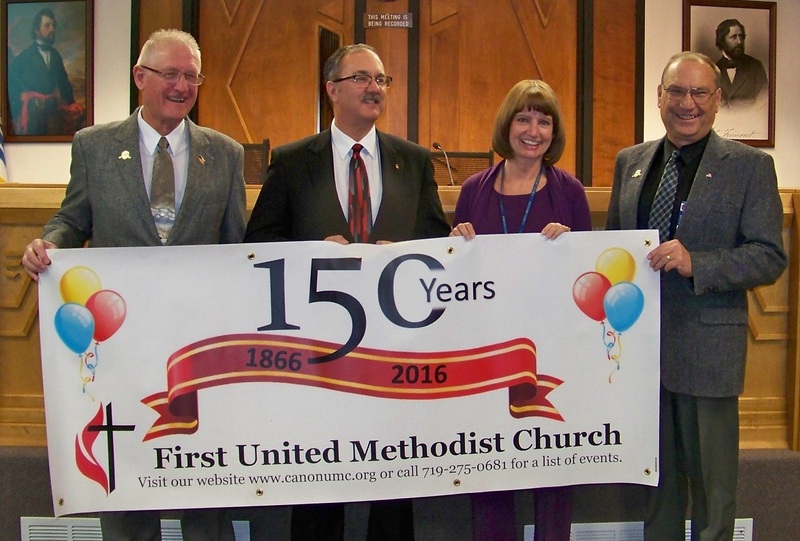 Members of Cañon City’s 1st United Methodist Church and Pastor Eric Feuerstein were in attendance as the Board of Commissioners adopted a proclamation declaring 2016 as a Year of Celebration for the 150th Year of Ministry for 1st United Methodist. The proclamation noted that the church had its’ humble beginnings in 1860 in an unfinished log cabin and then became the first permanently established church south of Denver when it was dedicated in 1866. 1st United Methodist Church of Canon City Pastor Eric Feuerstein is flanked by the Board of Commissioners as they hold a banner celebrating the church's 150th anniversary in 2016. The Board of Commissioners awarded a bid to Colorado Crushing to perform rock and gravel crushing in the county’s Cottonwood gravel pit along County Road 2 in the Tallahassee area northwest of Cañon City. Colorado Crushing will crush 20,000 tons of aggregate at a cost of $3.50 a ton. Department of Transportation Director Tony Adamic said it’s been a number of years since any crushing was done in the pit and in recent years county road crews performed their own screening operations in the pit to get materials. The Commissioners also voted at their January 12th meeting to extend the exploration permit for the Dawson Gold Project southwest of Cañon City by another three years to February 26, 2019. Dr. Angela Bellantoni said the additional three years will give Zephyr Gold time to do more exploration and determine if they want to pursue a mining permit for the project along the south side of Temple Canyon Road on a BLM claim. Fremont County Commission Chairman Ed Norden also announced that a public hearing scheduled on January 12th on a service plan for a proposed Tallahassee Fire Protection District northwest of Cañon City was being postponed by two weeks. Norden said additional time was needed for public notice after changes were required to the legal descriptions of the proposed boundaries for the new fire district. The Board rescheduled the public hearing for 10 a.m. at the January 26th commissioners’ meeting. Amended the Fremont County Personnel Policies Manual regarding temporary full time employees and the health insurance policy language to come into compliance with the federal Affordable Care Act. This is one location in the lower end of Phantom Canyon where road crews hauled thousands of cubic yards of fill material to repair a washout. The road in this section of Phantom Canyon is now in the best shape it's been in years. 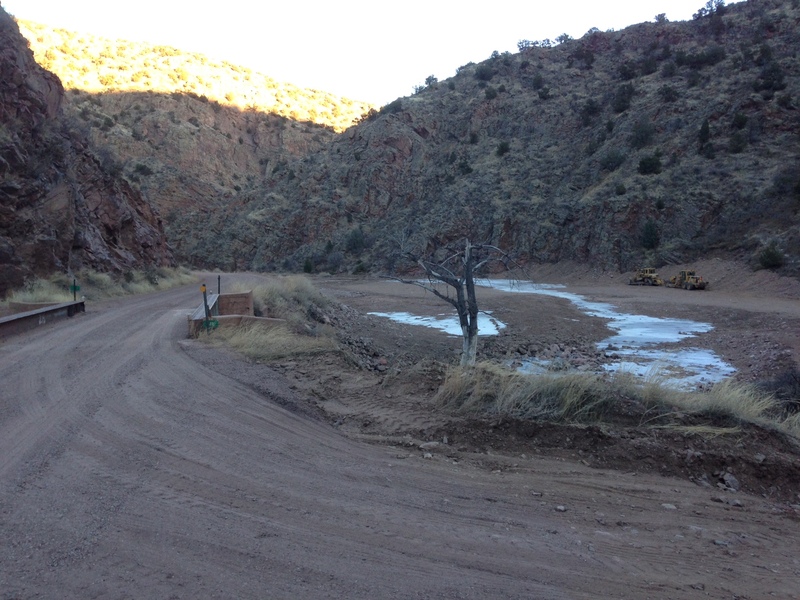 Phantom Canyon Road in Fremont County which was closed last May following severe flooding has been reopened. Crews with the Fremont County Department of Transportation (FCDOT) spent six weeks doing extensive excavation work to repair the many washouts. FCDOT Director Tony Adamic said his crews hauled an estimated 18,000 cubic yards of rock and materials to repair the washouts. Adamic said there were 18 different sites in the canyon which needed repairs. Fremont County Commission Chairman Ed Norden praised the work done by the crews saying that the repairs have greatly improved travel for motorists over the lower end of Phantom Canyon where most of the flooding damage occurred. Adamic said while the road was shut down for those six weeks it afforded crews to make other needed repairs to edges of the creek bank that had been eroding for several years. 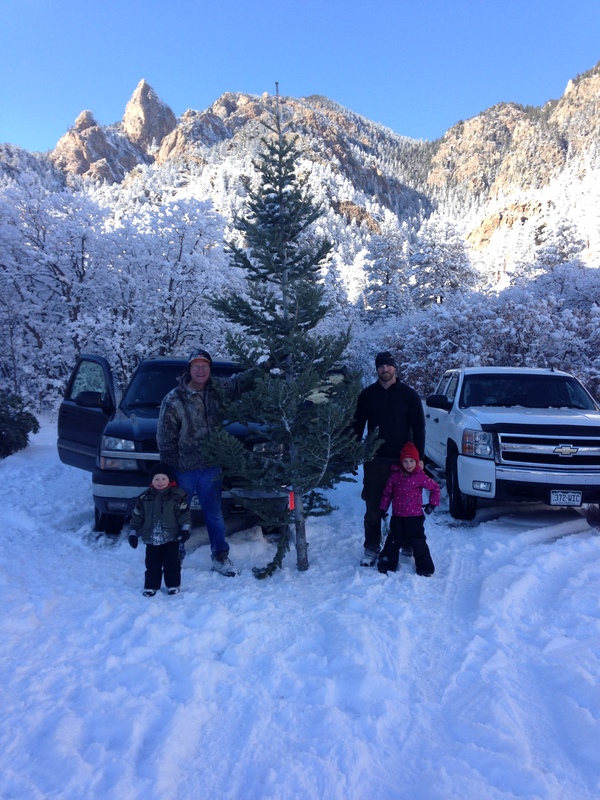 Norden urged motorists to drive up Phantom Canyon and get a first-hand look. He said repairs to the washouts have actually left the road wider in several spots which should hold up better during future high water events. Final costs of the project are still being tabulated but Adamic said because the Bureau of Land Management allowed the county to excavate the road and fill material from within the canyon it should have reduced transportation costs for the repairs by about $200,000. 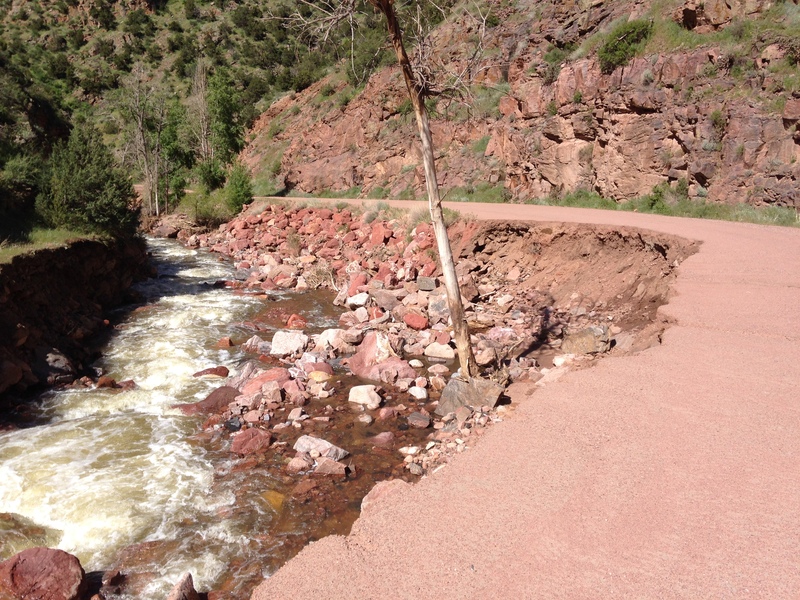 This location in Phantom Canyon reflects the worst of the 18 washouts that took place in the May, 2015 flooding. This July 1st photo shows the Arkansas River ripping away the concrete wall on the Riverwalk levee just west of the Raynolds Avenue Bridge. Even more of the levee collapsed into the raging torrent in the weeks that followed. A bid has been awarded by the Fremont County Commissioners which will allow work to begin on the long awaited repairs to the levee on the Arkansas Riverwalk west of the Raynolds Avenue Bridge. The concrete wall was undermined by high runoff on the river last May and June. 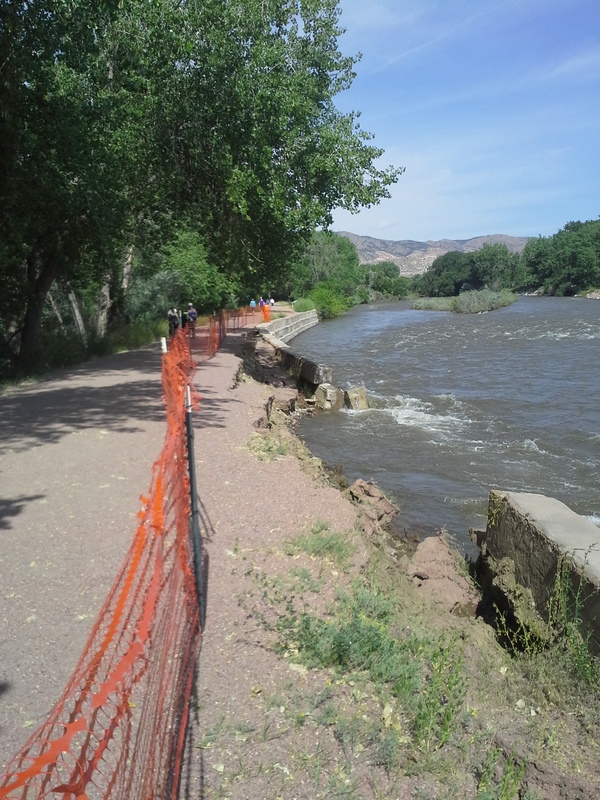 Initially the Cañon City Recreation and Park District began engineering work for the repairs but then learned that the levee where the riverwalk crosses became the responsibility of Fremont County back in the 1960’s when the original flood conservancy district was dissolved. The Board of Commissioners on Tuesday awarded a contract for the reconstruction to Whinnery Construction of Lake City, Colorado. Whinnery submitted the lowest of three bids at $147,235. The other bids included Tezak Construction at $216,168 and Avalanche Excavating at $267,413. Seventy-five percent of the cost will be borne by the Federal Emergency Management Agency while the county will pick up the other 25 percent. The Cañon City Recreation District has already spent about $14,000 on preliminary engineering for the project. It’s anticipated the reconstruction will involve more of a rock face on the levee instead of restoring a concrete block wall. The U.S. Army Corps of Engineers has already given their approval for the contractor to perform work within the river channel. The Board of Commissioners on Tuesday also approved a Commercial Development Plan and a liquor license change of location for Mike Abbott. Abbott will relocate the Waterhole #1 liquor store from 1503 Elm Avenue to a spot just down the street at 1532 Elm Avenue. Abbott said an increase in rent prompted him to buy the property at Highway 115 and Elm to relocate. Devin and Corie Ames testified against the relocation saying it’s inappropriate for a liquor store to abut against their residential property directly to the north. The Ames complained that motorists already use the right of way in front of their property to turn around on Elm Avenue. Commission Chairman Ed Norden said as long as those motorists are using public right of way along Elm Avenue they are free to park or turn around. Commissioner Debbie Bell noted that the new location is zoned “Business” and use of the property for a liquor store is a permitted use in that zone. The Board of Commissioners on Tuesday also took the last formal actions on resolutions adopting a 2016 county budget, appropriating funds for the budget, and levying the necessary 12.322 mills in property tax for the budget. That mill levy is the maximum allowed by law plus an annual allowance for recovery of tax abatements and refunds. The Commissioners also certified the mill levies that will be collected for 2016 property taxes for every governmental entity in the county that relies on property tax revenue for their operations. Commissioner Norden noted again that of all property taxes collected only about 20 percent of the total goes to fund county government. Ratified the chairman’s signature on a contract to replace the door entry security system in the Fremont County Judicial Center. County Finance Director Sunny Bryant said the new system will cost about $48,000. The present system has failed and cannot be repaired. Judicial employees now have to use keys on those doors to move about the building in the interim. The Fremont County Board of Commissioners has scheduled a special meeting to consider license renewals for three medical marijuana operations in unincorporated Fremont County. The special meeting is set for Thursday, January 7th, at 9:00 a.m. in the Commissioners’ board room. As part of the license renewals the Commissioners will review any complaints filed over the past year against the operations and any state and Sheriff’s Department investigative reports. The Commissioners also recently scheduled a public hearing for their January 12th meeting to consider a service plan for a proposed Tallahassee Fire Protection District. The volunteer fire department that now serves the Tallahassee area northwest of Cañon City and along the High Park Road towards Teller County is proposing creation of legal entity which would require an election by the voters within the defined boundaries. State law requires the Board of Commissioners to review and approve a service plan at a public hearing before the issue can be presented to the voters. The Tallahassee volunteers hope to put a question to the voters in May, 2016. Although the public hearing was originally set for January 12th, corrections were needed to the legal description of the district’s boundaries which delayed the legal publication of the hearing in the newspaper. Because of that the Board of Commissioners will have to continue the January 12th scheduled public hearing until their regular meeting on January 26th. The Fremont County Board of Commissioners presents Recording Assistant Director Janis DeCino with her certificate as 2015 Employee of the Year. The honor included presentation of a $300 check. The Assistant Director for Recording in the Fremont County Clerk’s Office was announced Tuesday as the Fremont County Employee of the Year for 2015. Janis DeCino, who has worked in the Clerk’s Office for 14 years, was humbled by the award and brought to tears over being honored. 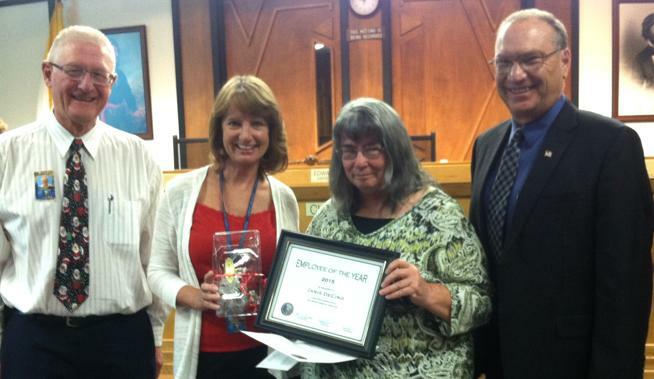 DeCino was one of 14 county employees nominated across a number of county offices. Nominations were made by fellow employees and the final selection was made by the group of Fremont County Elected Officials. In the letters of nomination her fellow employees described her as "always pleasant, hard working, meticulous and considerate," and she "shows compassion and empathy, pays attention to detail, exceeds expectations and is an inspiration to others." The other 13 nominees included David Gall, facilities; Charlene Halstead, administration department; Kristi Kleven, Department of Human Services (DHS); Carrie Porter, DHS; Karen Prentice, Clerk's office; Jim Berg, DHS; Amanda Rodenbeck, DHS; Cassandra Rusk, DHS; Linda Sand, DHS; Roxanne Schuster, DHS; Brandy Wilcox, DHS; Aaron Broaddus, facilities department; and Josh Curliss, DHS. Commission Chairman Ed Norden praised the work of all the nominees saying "If you have fellow employees who submitted a letter of nomination, it reflects greatly on the job that you do alongside the other employees in Fremont County.” He said that effort is recognized by other employees and the public they serve. The Bureau of Land Management Front Range Fire Management Unit will be conducting pile burns in Phantom Canyon northeast of Cañon City starting this week. The piles consist of accumulated debris from the flooding earlier this year and will help reduce impacts from future flooding events. The BLM estimates the burn will include approximately 25 piles in the southern portion of Phantom Canyon. Phantom Canyon Road will remain closed during the burn operation. For additional information, contact Ty Webb at (719) 269-8560 at the BLM Royal Gorge Field Office in Cañon City. The Fremont County Board of Commissioners is accepting letters of interest from citizens wishing to fill a vacancy on the Fremont County Planning Commission. One seat on the seven-member Planning Commission is open following a recent resignation. In the past this seat has represented the Penrose area. The person appointed will serve the remainder of a three term which expires on December 31, 2016, and would then qualify for reappointment. The Planning Commission meets on the first Tuesday of each month at 3:00 p.m. to review land use proposals, such as subdivisions, zone changes, and use permits. The Commission then makes recommendations to the Board of County Commissioners which makes the final decision. Any citizen interested in serving can apply for the Planning Commission vacancy although the Board of Commissioners may show preference to appoint someone to represent the Penrose area. Persons interested in an appointment to the Planning Commission should state their qualifications and reasons for wanting to serve in a letter. Submit it by mail or in person to the County Commissioners at 615 Macon Avenue - Room 106, Canon City, Colorado 81212. The deadline for letters is 12 noon, Tuesday, December 22nd. For more information concerning the Planning Commission please contact the Department of Planning and Zoning at 276-7360 or by email at planning@fremontco.com. Following a fifteen minute appeal to the Board of County Commissioners about the financial problems facing the Fremont County Humane Society, County Commission Chair Ed Norden said it’s an issue that needs far more detailed discussion. Humane Society Executive Director Doug Rae made his presentation to the Board of Commissioners at their November 24th meeting saying that for the first time the Humane Society is seeking across the board increases in funding next year from local government. The government entities that rely on the Humane Society to take in dogs and cats are the City of Cañon City, the City of Florence, and Fremont County. Rae said the funding requests for 2016 to those local governments reflect the fact that no one entity will be hit harder than the next. Rae said “We can’t afford another $60,000 loss.” He said “We spend thousands more than we have coming in.” Rae said the Humane Society lost over $100,000 in 2014 and through October of 2015 they have sustained another $45,000 loss. Rae distributed a report to the Commissioners that showed the Humane Society took in 145 dogs and cats during the ten month period from January through October of this year. He said another 182 animals running at large were taken in from citizens across the unincorporated areas of the county while the number dogs and cats owned by residents in rural Fremont County that were turned in totaled 223. Commissioner Norden said that the funding request Rae submitted to the Sheriff for 2016 and the statistical report he provided needs to be sorted out in a face to face meeting that should include Sheriff Jim Beicker. That discussion has tentatively been set for December 7th. 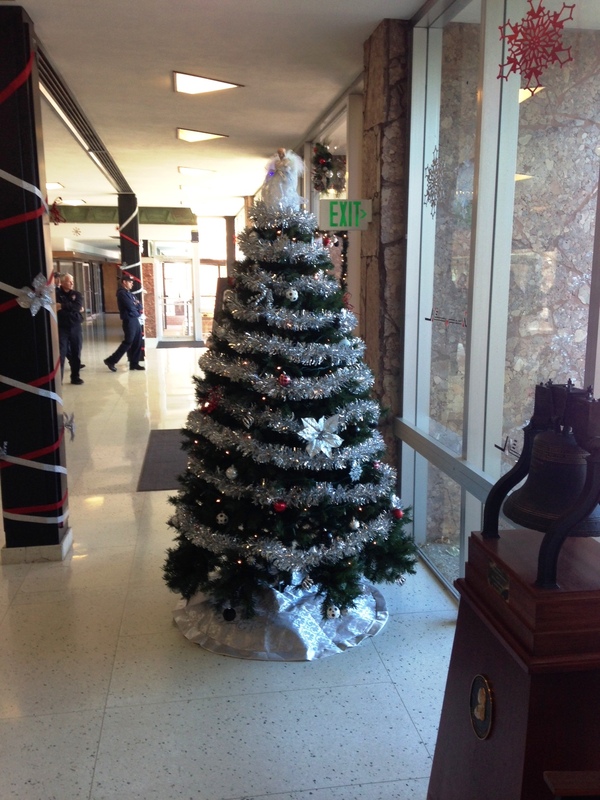 Fremont County Head Custodian Bobbie Miller and her crew have been busy decorating the County Administration Building in the festive colors and lights of the holiday season. The Fremont County Commissioners will give more consideration to a proposal that would allow Accessory Dwelling Units (ADUs) through creation of a countywide overlay zone district. That was the outcome of a public hearing on the proposed zoning amendment at the Commissioners’ November 24th regular meeting as the Board voted to table the amendment pending more study. The motion to table was put forth by District One Commissioner Tim Payne after opposition was expressed by the Penrose Water District and the Beaver Park Irrigation Company. Both voiced concerns that allowing ADUs on parcels of one acre or larger would increase density in the Penrose area and increase demand for water which is in limited supply around Penrose. Charlotte Norman of the Penrose Water District said the district does not have and will not have enough water to support an increase in density. She argued that allowing ADUs goes against the master plan for the Penrose area which primarily allows 4 ½ acre parcels. Norman also said increasing density will overload the formations of shale rock around Penrose and cause septic systems to leak raw sewage into the ditches. As proposed the zoning amendment would permit a total of two residences on a single parcel that is a minimum of one acre in size. The ADU could be no larger than 1,000 square feet, have no more than two bedrooms, and only one bathroom. The ADU’s would share utilities with the primary residence. District 2 Commissioner Debbie Bell said the Board received a number of letters both in support and opposition to the amendment. Ray Pittman was among those testifying in favor of ADUs. He said he and his wife live in a small two bedroom home and under current regulations their kids have no way of moving onto the property to assist them as they age. Dee Dee Clement of Loaves and Fishes also spoke in support saying the ADU amendment offers a potential solution to the housing crisis currently being experienced in Fremont County. The Fremont County Planning Commission had recommended that two requirements be removed from the amendment. One is that the property owner would first have to build the primary residence prior to building the ADU and that the property owner must live on the property. Commission Chairman Ed Norden said in whatever form the amendment comes back for consideration he still believes those two restrictions should remain among the requirements. Norden said he was surprised at the number of positive comments regarding the ADU amendment because it seems to offer a common sense approach to the housing problems and simply makes good sense to the community. In the meantime the Board of Commissioners intends to study the matter further to see if there is some way to exclude specific areas like Penrose while still allowing ADU’s to proceed elsewhere in the unincorporated areas of the county. The Commissioners may or may not take the issue back to the Planning Commission. The matter was tabled until the February 9, 2016 board meeting. Heard a presentation on stormwater mitigation concerns from Manny Colon. Colon spoke on behalf of the Hydraulic Ditch Board saying he hopes the ditch company can work together with Fremont County and the City of Cañon City to address stormwater problems that develop in Cañon City neighborhoods when heavy rains flood into the Hydraulic Ditch and overtop the ditch flooding several residential areas.